The DV Developer product contains the newest operating system builds and backend hardware. If you reinstall your operating system, your (ve) Server will automatically become a DV Developer server. All pricing and resource allocations remain the same between the (ve) and DV Developer. 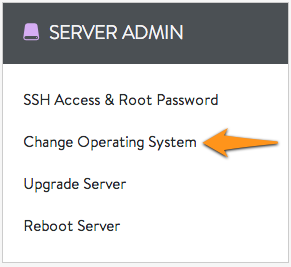 You can reinstall your server at any time with a new operating system directly in the Account Center. For more information about the various operating systems you can choose from, please see our product page. Select your domain from the Domains menu. You will now be presented with a list of available choices for your DV Developer(ve) server. Choose your new distribution and click the Change OS button. While your new OS is installing, you will see a spinning icon to the right of the OS you chose. Feel free to stay on the page to see when the installation is complete or come back in a short while. Navigating away from this page will have no effect on your installation. Once completed, you can begin using your new OS. Any data from your previous system will be moved to the /old directory. Please delete or archive this data as it will count against your total disk usage.